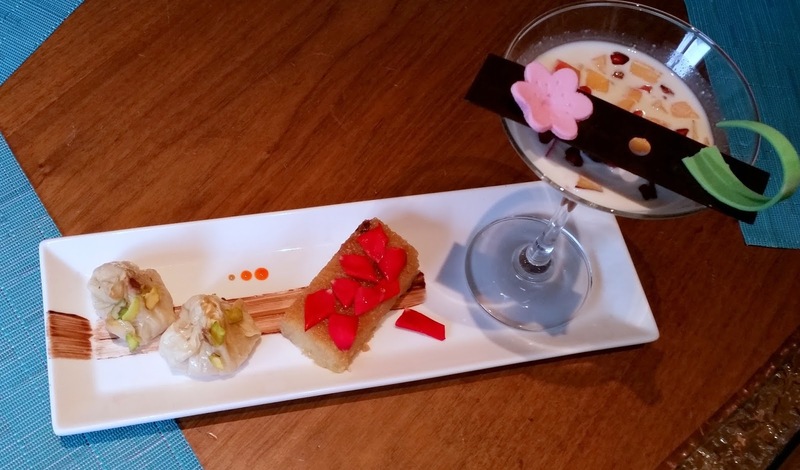 Chef Sarabjit came across a very affable person, with a deep knowledge of his trade. 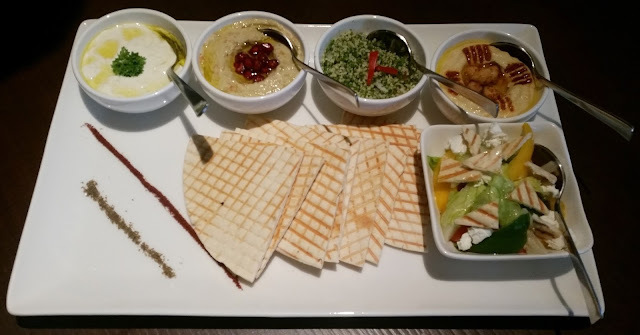 He welcomed us with a platter of well-known dips and accompaniments from West Asia and Greece. There were the chickpea-based Hummus, the green Tabbouleh, Greek Tzatziki and Fattoush salad. We enjoyed the dips with some good pita bread. My favourite from the lot was Babaganoush, a smooth preparation of eggplant and cream. The starters also packed quite a punch. The deep fried Sambusek had a filling of minced meat and pine nuts, and a second helping could not be resisted. 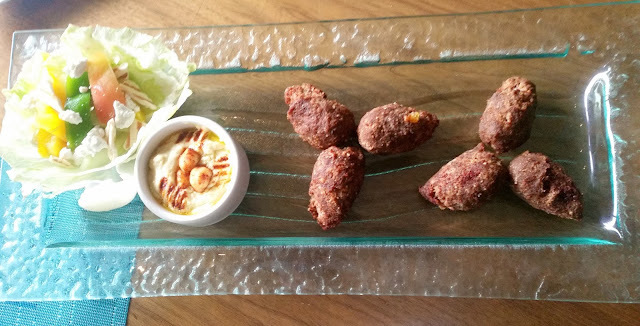 Another minced meat dish Kibbeh which was deep fried also suited my taste buds. 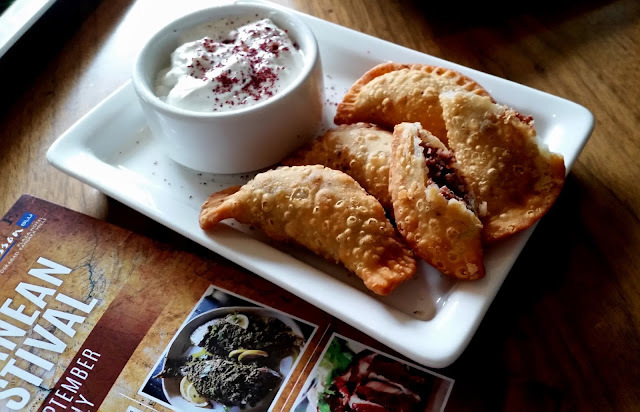 For vegetarians, there was Samousa, an Arabic variant stuffed with spiced potatoes and peas and Falafel, the best known Mediterranean starter of chickpeas. 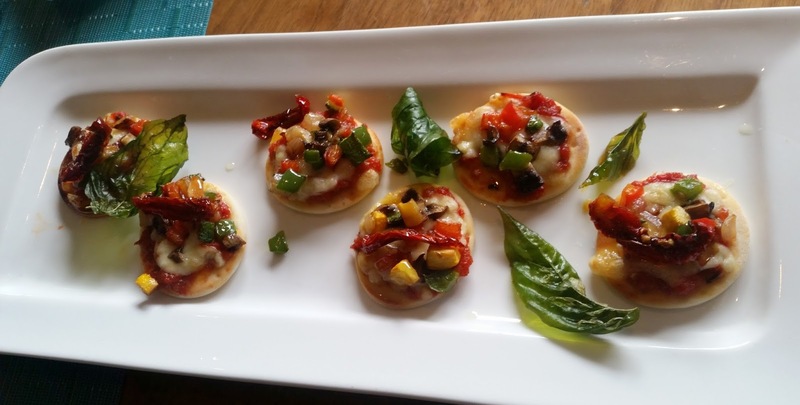 Among the appetizers, an interesting one was Pizza Coins – bite sized pizzas topped with cheese, tomatoes, and olives. 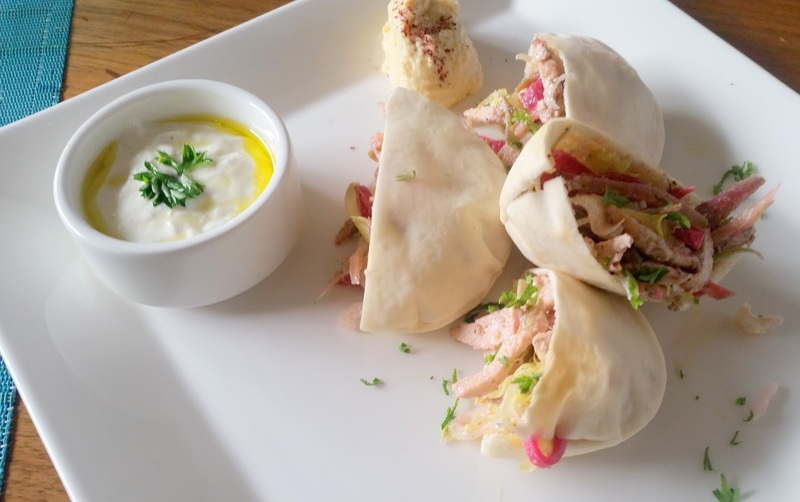 The Greek Shawarma had pita pockets stuffed with chicken strips, lettuces and tartar sauce. The herbs and pickled veggies made this combo even better. 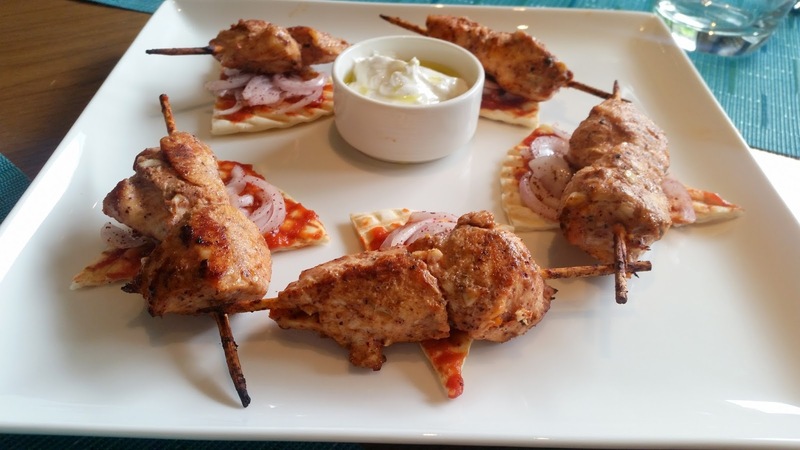 The Lebanese Shish Taouk kababs were served tastefully on pita bread layered with tomato paste. The chicken version was soft and succulent, though for me the Arabic version of seekh kababs usually means lamb. 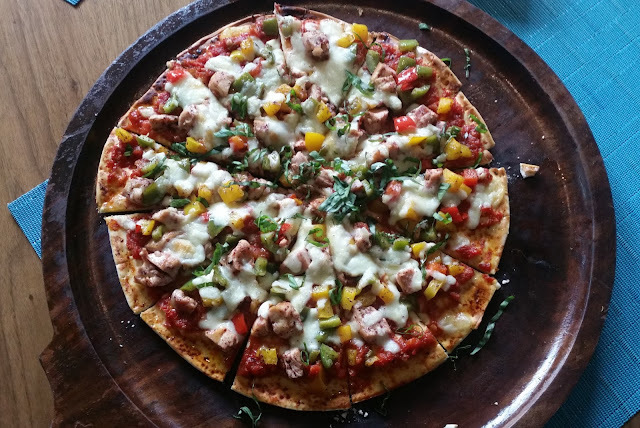 A Pizza with toppings of chicken, cheese, olives and tomatoes looked really attractive. In general, the all the dishes were styled and plated brilliantly, Chef Sarabjit seems to have a natural flair in this area. Over to the main courses then. There was the Spanish Paella, an al dente saffron infused rice preparation with shrimps and tomatoes. 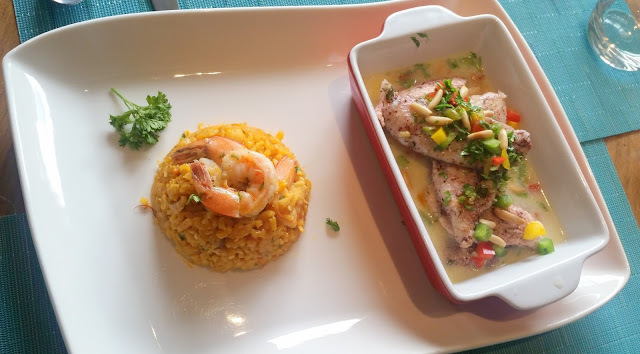 I am not a big fan of continental rice dishes, but this was quite flavourful. Perhaps the best dish of the day was Samke Harra with Trabulsiya Sauce. It was a Lebanese specialty baked dish of grilled fish, and the tahini based sauce in which it was served was truly sublime. 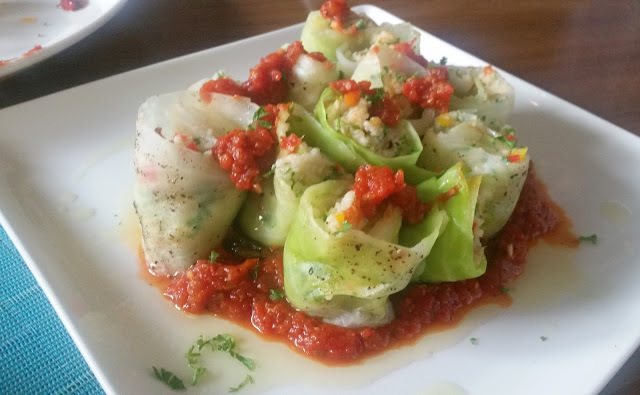 The best-looking dish was Cabbage Dolma, cous cous stuffed cabbage leaves served on a bed of tomato based sauce. 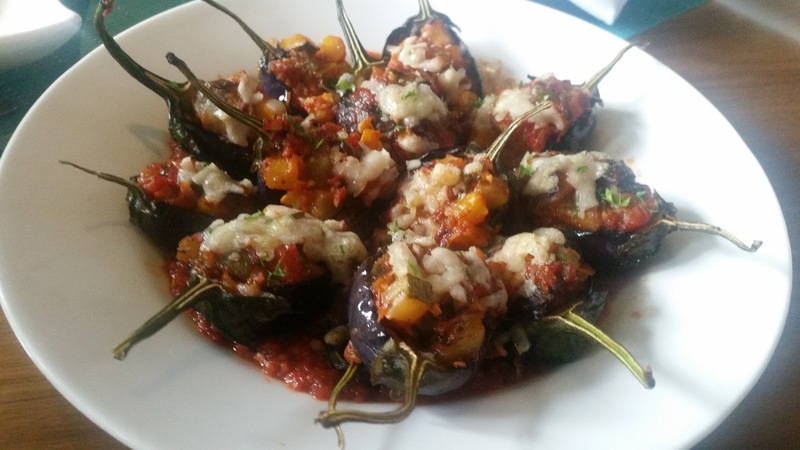 I love eggplant-based dishes. Imam Baildi, a roasted whole eggplant dish stuffed with cheese and tomato with oregano and basil was a Turkish dish which was being showcased and it did not disappoint me at all. Finally the desserts. Lab-e-Shireen, a light custard with abundant fruits and nuts and scented with rose syrup was appreciated. The Baklava, served as pockets was a tad bit dry. The other desert was Basboussa, a semolina-based sweetened Turkish dessert. Overall, a very impressive festival. A large proportion of the preparations wowed me, which does not usually happen. The promotion is part of the usual buffet, where it supplements the usual spread. Usually I am not a big fan of promotions in all-day dining restaurant due to the fact that a number of dishes from the promotion needs to be curtailed to accommodate usual suspects like Indian or oriental items. 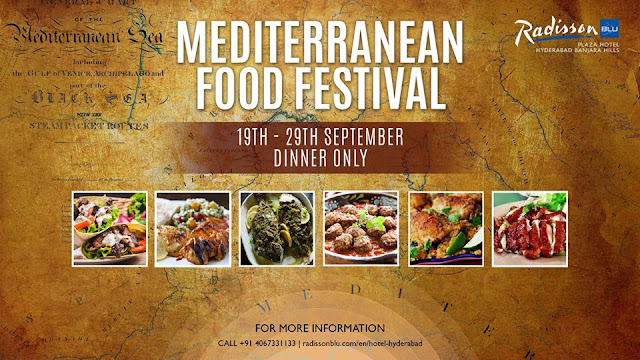 However, here the dishes served in this promotion are from a number of countries around the Mediterranean Sea provides a lot of variety. 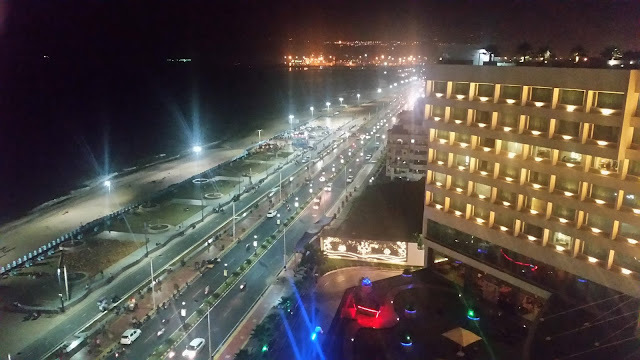 The buffet is priced at Rs 1250 (plus taxes) and is available only for dinner.